We’d love your help. Let us know what’s wrong with this preview of Under The Visible Life by Kim Echlin. Fatherless Katherine carries the stigma of her mixed-race background through an era that is hostile to her and all she represents. It is only through music that she finds the freedom to temporarily escape and dream of a better life for herself, nurturing this hard-won refuge throughout the vagaries of unexpected motherhood and an absent husband, and relying on her talent t Fatherless Katherine carries the stigma of her mixed-race background through an era that is hostile to her and all she represents. It is only through music that she finds the freedom to temporarily escape and dream of a better life for herself, nurturing this hard-won refuge throughout the vagaries of unexpected motherhood and an absent husband, and relying on her talent to build a future for her family. Orphaned Mahsa also grows up in the shadow of loss, sent to relatives in Pakistan after the death of her parents. Struggling to break free, she escapes to Montreal, leaving behind her first love, Kamal. But the threads of her past are not so easily severed, and she finds herself forced into an arranged marriage. For Mahsa, too, music becomes her solace and allows her to escape from her oppressive circumstances. When Katherine and Mahsa meet, they find in each other a kindred spirit as well as a musical equal, and their lives are changed irrevocably. Together, they inspire and support one another, fusing together their cultures, their joys, and their losses—just as they collaborate musically in the language of free-form, improvisational jazz. To ask other readers questions about Under The Visible Life, please sign up. The book said that Katherine's husband, T, converted to Islam while in jail and took on a Muslim name. It said that lots of black men did that because it allowed them entry to places that forbade entry to Negroes but permitted entry by Muslims. Is this factual? Did that really happen in that era (black men converting to Islam for that reason)? Katherine is upset because a negative review of her recording referred to her feminine sound. She felt that nobody would be critical of or even refer to a masculine sound. If 10 piano players interpreted and recorded an instrumental version of the same song, would experts be able to tell which were female and which were male - at least most of the time? And if yes, what would be the clues. Notes to self: to read, and read again. I've lived this life, in many respects. And Echlin's got it right. All the details. All the nuances. All the sad, happy business of living under the visible life. The places are exact. The music is authentic. I recognize all the characters -- in fact, I know many of them as players in my own life. Katherine and Mahsa's friendship is the line that connects me to my best friends, for I have more-than-one Katherine-Mahsa friendship in my life, as many of us do, who live under the visible life. The most radical thing a woman can do is live. Live, as an active verb: neither as defiance, affront or provocation. But as celebration. As statement. To hell with all those who doubt it. Where were you when it was all going down? This is a deeply personal novel which will only hit its mark if you have known Katherine or Mahsa. Otherwise, it will just be white noise, and you shouldn't waste your time. Some people will just never get it, and is not worth expending a breath to explain. Some people will never know either Katherine or Mahsa -- and for this I mourn the poverty of their lives --no matter how many Instagram photos they post, to pretend otherwise; no matter how many self-help cult books they read to enrich that poverty. To be blunt and up-front, this book was not the book for me. That being said, it was a truly mesmerizing story! It was very hard for me to get into this book but it was still beautiful nonetheless. I want to say that upfront since my rating is based off my opinion of the book (and I wasn't pulled into the book) but the story is still a worthwhile read! I am sure many other readers will be able to connect with t Under The Visible Life is a moving story by Kim Echlin that will knock your socks off! To be blunt and up-front, this book was not the book for me. That being said, it was a truly mesmerizing story! It was very hard for me to get into this book but it was still beautiful nonetheless. I want to say that upfront since my rating is based off my opinion of the book (and I wasn't pulled into the book) but the story is still a worthwhile read! I am sure many other readers will be able to connect with this story and fall in love with it in ways that I couldn't. Kim Echlin is amazingly talented and I highly suggest this novel. I did love that this story revolved around women and their realistic lives. The book didn't feel over the top. It felt honest and real in ways that other books haven't lately. I think this is how the book will sit well with people. Somehow, this story felt like I could have been hearing or reading a non-fiction novel. The struggles felt real and the characters felt like I could have walked by them on the street. Kim Echlin deserves a lot of recognition for just being able to do that in one book. It's mind-blowing! So, why was this book not for me? I found it really hard to sink into. I had to force myself to read each chapter and it felt way too slow. I like a fast paced book that gets me hooked, and this book is not that. It's raw, real and slower paced. The book isn't boring by any means, it just wasn't made for me (which is a good thing!). As a reader, sometimes you have to admit that you won't love ALL books. But that's art! I can still appreciate how absolutely stunning this book was. And I will highly recommend it every single day because this book is definitely made for other readers! Under the visible life, is a beautiful and complicated novel that touches the heart. The story is told through two narratives. I am normally not a fan of duel narratives but it works well in this novel. I did prefer Katherine's character, but Mahsa's narrative was good for adding drama and thoughtful dialogues. Some parts were tough to read due to the character's struggles, but I still couldn't put it down. Top notch book. This was a GoodReads first reads giveaway, which I won in March. The publisher provided an uncorrected proof, but no one has attempted to influence my opinion in any way. "Patience is bitter, but it has a sweet fruit." Mesmerizing. These are the struggles than women all over the planet have to deal with every day. Being taken seriously as professionals. Juggling marriages, children, housework, careers. Getting stuck doing all the stuff that no one else wants to do. But that makes this book sound pe This was a GoodReads first reads giveaway, which I won in March. The publisher provided an uncorrected proof, but no one has attempted to influence my opinion in any way. But that makes this book sound pedestrian and it is anything but boring. From the first paragraph, I was entranced and stayed that way throughout the book. I just couldn’t look away. The only way I had to make it stretch out was to read it only on my lunch hour—that slowed me down and allowed me to savour each chapter, as they alternate between Catherine and Mahsa. It is also a book about race—Catherine’s mother is Canadian and her father is Chinese before that is socially acceptable. As if that was not enough, Catherine marries a black American man and has three children with him. Mahsa’s father is American and her mother is Afghan. Her Afghan uncles murder her parents because they do not approve of the marriage and Mahsa eventually escapes to Canada. Nevertheless, she ends up forced into an arranged marriage and becomes mother to two children. So many of the situations that Catherine and Mahsa find themselves in are similar to events in my own life—I think that I appreciated these story lines so strongly because I haven’t followed a traditional life path either. And yet, I think these two women represent so many women’s experiences, whether traditional or not. The choices that we have to make as women—do we get married? Have children? Pursue the safe path or strike out in something more risky? Are our families helpful or disapproving? Are we strong enough to pursue our own path and hell take the hindermost? What is absolutely heroic is the way both women hang on to their music and insist on having their own life and their own careers, despite all the societal barriers to it. They pour their hearts and souls into jazz when there is little energy leftover for anything else. They show complete dedication and determination to make it in the music scene. It makes my career look pale by comparison—I wandered into my line of work and never really had enormous struggles, just the everyday irritations that occur in almost any job. I’m not sure that I have ever had anything that I would dedicate myself to the way these two women do. [In fact I cried a couple of years ago when I got a 30 year award from my union—I felt it meant that I had no ambition]. It leaves me feeling conflicted—I have never had to worry about racial discrimination and no one has stood in my way as I’ve planned my life, so I’m very lucky. But I find myself envying these women in their drive, their commitment, and that they so clearly know their vocation and are willing to work so hard for it. Yet I know that in my own way, I have played my role in the world too. A good book to partner with this one: Half Blood Blues by Esi Edugyan. Also about jazz musicians, black men playing jazz in Europe as the Second World War looms. "Una nota è un suono, due note una canzone". Due donne (anzi, due bambine, due ragazze, due donne), le loro storie, le loro vite: i genitori, l’educazione, il sesso, l’amore, la maternità, le difficoltà, i sacrifici; ad accomunarle la passione per la musica jazz e per il pianoforte. Per vivere, bisogna rischia "Una nota è un suono, due note una canzone". Per vivere, bisogna rischiare il disastro. Abbandonare la vecchia strada per creare qualcosa di nuovo. Amare la vita che non vedi. An outstanding book. so under the radar in 2015 - why? WHY? Echlin writes straight from the heart. Straight, clean, unencumbered-with-clauses-or-literary-embellishments sentences that pour out raw emotion onto the page. And it's a slow build - it feels, sometimes, like these easy, basic sentences, paragraphs, chapters can't possibly do such heavy lifting. Until she drops a phrase or ends a chapter or turns the plot and you are whomped by the depth of what she's saying, the artistry of what she's An outstanding book. so under the radar in 2015 - why? WHY? Echlin writes straight from the heart. Straight, clean, unencumbered-with-clauses-or-literary-embellishments sentences that pour out raw emotion onto the page. And it's a slow build - it feels, sometimes, like these easy, basic sentences, paragraphs, chapters can't possibly do such heavy lifting. Until she drops a phrase or ends a chapter or turns the plot and you are whomped by the depth of what she's saying, the artistry of what she's doing. More to come, maybe, later. انتهيت من أجمل القراءات هذه السنة. قرأتها خلسة بما اني اتخذت قراراً غبياً في الامتناع عن القراءة في شهر رمضان لكن الكلام سهل ! الرواية تحتاج ريفيو من اشخاص ملمين في المراجعات والاكيد مو انا. مختصر الرواية عن حياة المرأة في الشرق والغرب ومهما اختلفنا تظل المرأة اساس الكفاح والتضحيات. There is something so compelling about the way this story explores the intersections between friendship, motherhood, career and love. There are these moments that are so perfectly described, where everyday life gives way to explosions of joy or rage. It's remarkable. منذ زمن بعيد لم تحركني الكلمات كما فعلت كلمات هذه الرواية.. I received a free copy of Under The Visible Life by Kim Echlin through Goodreads give away and I am glad I did; otherwise I would be unlikely to have read this book which I quite enjoyed. The story is told in alternately chapters through the eyes of two women who eventually meet, spanning the years from the '40s through the '80s with stops in Pakistan, Hamilton, Montreal and New York. Katherine of mixed Chinese and Caucasian heritage grows up in Hamilton with her single mom. She is driven by her I received a free copy of Under The Visible Life by Kim Echlin through Goodreads give away and I am glad I did; otherwise I would be unlikely to have read this book which I quite enjoyed. The story is told in alternately chapters through the eyes of two women who eventually meet, spanning the years from the '40s through the '80s with stops in Pakistan, Hamilton, Montreal and New York. Katherine of mixed Chinese and Caucasian heritage grows up in Hamilton with her single mom. She is driven by her passion for music. She joins a jazz band and tours with them until she becomes pregnant. She marries the African-American father and her story becomes one of the conflicts between career and family and her relationships with her mother, husband and children. Mahsa is the daughter of an Afghan mother and an American father. When her parents are killed she lives with an aunt and uncle in Karachi and later moves to Montreal for university where she studies music. Her story (which I found more suspenseful and interesting than Katherine's) details her conflict of culture especially after she is forced to marry a much older man and her efforts to keep her family together while trying to keep alive her own independence and her love of music. When Katherine's and Mahsa's musical paths cross, we have the added story of their friendship and how each was willing to help the other. A good plot with interesting characters, and enough ideas about love, family, marriage, career, music, independence makes this book worth the read. One of the most compelling and thought-provoking contemporary stories I've read this year is "Under the Visible Life" which I won through Goodreads/First Reads. It begins with two women, Katherine and Mahsa whose musical aspirations and collaboration fuse their diverse lives and mixed ethnicity into an enduring friendship. In a story of joy and loss, of victory and defeat Kim Echlin explores friendship, love, family and career that brings laughter and tears. Set in an era from the late 40's to th One of the most compelling and thought-provoking contemporary stories I've read this year is "Under the Visible Life" which I won through Goodreads/First Reads. It begins with two women, Katherine and Mahsa whose musical aspirations and collaboration fuse their diverse lives and mixed ethnicity into an enduring friendship. In a story of joy and loss, of victory and defeat Kim Echlin explores friendship, love, family and career that brings laughter and tears. Set in an era from the late 40's to the present Katherine and Mahsa's lives are forged in a period of turbulence, intolerance and injustice; a world that shook under the violence of black segregation and the civil rights movement, the war in Vietnam, by the kidnappings of the Front de libération du Québec in Montreal and terrorism in Pakistan and Afghanistan. From mixed races Katherine and Mahsa suffer the anguish of loss as children, the pain of a separation and a forced marriage as adults but through the beauty of the language of music and with hearts that want to share and inspire others they find hope in their darkest hours. In this well-developed plot Kim Echlin writes with insight and powerful emotion that keeps the reader riveted from the first page to the last. The mood of this story is often tense, sombre and discouraging as Katherine deals with an absent husband and raising three children while struggling to further her career. Mahsa, a music student at McGill can't leave the oppressive strictures of her culture behind as she's forced into a loveless, arranged marriage with a man who despises her talent, demanding instead her surrender to a life of invisibility. In their friendship and love of improvisational jazz these remarkable women create an unbreakable bond that brings the light of encouragement and the promise of love, comfort and hope into the darkness of the troubles that swirl around them. Katherine and Mahsa are unforgettable women with complex natures who struggle bravely against the forces that would keep them from their passionate, insatiable and unreasoning desire to create and share the music they love. Mahsa Weaver haunted by the assassination of her parents is an intelligent, superficially obedient and stubbornly determined young woman who escapes the oppression of her family in Karachi to get an education in Montreal. Yet loyalty draws her back into a web of deceit that forces her into a marriage with Ali, a traditional Muslim businessman who demands Mahsa's acceptance, complacency and submission as his wife. With steely, spirited determination she continually thwarts his plans until her daughter's life is used as a pawn to gain her obedience. Her only solace throughout the years is her friendship with Katherine, her music and the memory of the love of her youth. Half Chinese and raised by a single mother after her father's desertion, Katherine Goodnow is a fighter who taught herself to play the piano. A quick study, determined and gutsy musician she finagles a job as a piano player in a band and falls in love with the talented T'Minor (Theodore Lincoln Jones) a restless , moody and angry black saxophone player whose "bottomless pain" drives his drug addiction. Highly independent Katherine valiantly struggles with poverty while blending motherhood with her musical ambition. It is these characters and others that add passion, energy and drama to this haunting tale. “إذا سُرقت أحلامكِ، فقد سُرقت حياتكِ بأكملها”. Under The Visible Life is a powerful story filled with strong emotions. Very well written, by new-to-me author Kim Echlin! This author nicely blended her rich characters Katherine and Mahsa into this beautiful story of friendship and the bonds that held them together. Fatherless Katherine and orphaned Mahsa, share a mutual interest, the love of music. Their lives will intertwine and their art will forever change their destiny and the friends that shared their lives. This story is Amazing story! This is the story of two women. Katherine and Mahsa come from very different backgrounds, but one thing they have in common is their love of the piano and jazz music. The story is told from each of their point of views and spans years. In time they eventually end up meeting and become best friends. Their stories are heartbreaking at times and at other times uplifting. This book is truly both a tale of resilience and survival. It's a wonderful read that inspires us to live our lives for ourselves the best way we can. There was lots to enjoy about this book. Both of the main characters had heart-breaking yet optimistic story lines that give you lots to think about. I found Mahsa's early life especially interesting. However, this was billed as a book about friendship, and I never really got a good feel for their friendship since there were so few scenes with the two women interacting. It almost read like two separate (albeit excellent) stories. I loved this book. Well-written, haunting, and the characters stay with you long after you finish the book. The characters were so well-developed that they seemed like real people. The two main characters come from totally different backgrounds, but are still brought together, and the novel pulls you in and makes you want to keep reading and turning the pages. Nicely paced, well-written, and totally absorbing. Loved this book. The characters, the atmosphere will all resonate with you and stay with you long after you finish reading. The research the author did for this book is incredibly and so illuminating. The books deserves it's own jazz soundtrack, it's that good! This is a splendid novel. The story of these two women, and how their love of playing jazz and the love for their families, intertwine is very compelling. 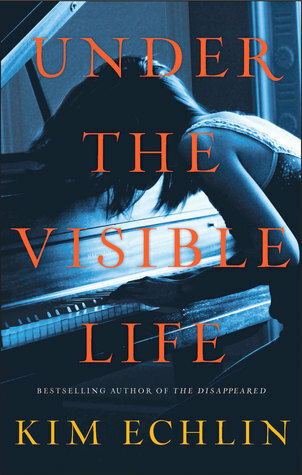 I received Under The Visible Life from Goodreads First Reads. This was a beautiful, inspiring and at times sorrowful read about a friendship that blooms from the love of music. A beautifully written heartbreaker about two women with parallel lives. Kim Echlin is a gifted writer: a poet in the body of a novelist. I won this book through Goodreads.Kim Echlin is a local author. "Under the Visible Life" is the story of two woman, born on the opposite sides of the globe,but united through their love of music. Katherine, the daughter of a Caucasian mother and a Chinese father, suffers because of this background. She was born during the times, when mixed marriage was frowned upon. The authorities even took her away from her mother and sent her mother for "treatment". Her father fled to China.Her mother eventual I won this book through Goodreads.Kim Echlin is a local author. "Under the Visible Life" is the story of two woman, born on the opposite sides of the globe,but united through their love of music. Katherine, the daughter of a Caucasian mother and a Chinese father, suffers because of this background. She was born during the times, when mixed marriage was frowned upon. The authorities even took her away from her mother and sent her mother for "treatment". Her father fled to China.Her mother eventually got her daughter back; both suffered from their ill treatment. Katherine accompanies her mother to work. While her mother works, Katherine teaches herself to play the piano.Later, Katherine becomes involved in the local jazz scene and marries a black musician.She quickly has several children. Her husband, who has problems of his own, leaves them, and Katherine takes her family to New York City, in order to find work. Masha, too, is the daughter of a mixed marriage, an American father and an Afghani mother.Masha learns to play the piano.After her parents are murdered by the mother's disapproving family, Masha goes to Pakistan to live with her aunt and uncle.There, she meets a boy, who is enthralled by her music. Her guardians, who, unlike her parents, are very strict, disapprove of the boy and send her to Montreal to study at McGill.When she returns for a family visit, her uncle takes her passport and tries to force her into an arranged marriage. Masha is only allowed to return to her studies with her husband.At the university, Masha discovers a recording made by Katherine. Eventually the two women meet in a chance encounter and they become best friends. I really enjoyed this book. What really brought the story to life for me, was, that the author went into detail about the music scene during the 40's and 50's in the city, where I live, as well as in Montreal, my favourite city and New York too. I highly recommend this book. This review has been hidden because it contains spoilers. To view it, click here. The perks of being a familiar face at the local indie book seller is that once in a while you're handed an advance reading copy of a new book by a favoured author. Such was the case with the galley of Under The Visible Life that was passed into my hands. I fell head over heels in love with Kim Echlin's writing with 'The Disappeared,' and remember being excited to see that she would be releasing a new book in March of 2015. Excitement turned to apprehension when I realized that this was a book fil The perks of being a familiar face at the local indie book seller is that once in a while you're handed an advance reading copy of a new book by a favoured author. Such was the case with the galley of Under The Visible Life that was passed into my hands. I fell head over heels in love with Kim Echlin's writing with 'The Disappeared,' and remember being excited to see that she would be releasing a new book in March of 2015. Excitement turned to apprehension when I realized that this was a book filled with female characters. While the protagonist of 'The Disappeared,' was also female, this book looked entirely different in almost every aspect. We meet two strong women, the fatherless Katherine, who carries the stigma of mixed race parentage, and the orphaned Mahsa - both struggling for find lives for themselves free of hatred, prejudice and anger. It is only through a shared love of music that they are able to forge new lives for themselves. It is not an easy road for either woman, and yet when their paths cross, the shared passion and desire to create music instills within both of them an even stronger resolve to survive. 1940s to present: The story of two women, various moves to new countries and a mix of various cultures – and the one unifying force: Music. The cover and the blurb do not do this book justice in my opinion. This is one heck of a novel and an amazing tribute to all the Mahsa’s and Katherines of this world, to the Jazz greats and to the beauty of language and music. This is also a novel which got me in many powerful ways – the mix of cultures, the struggles and the racial prejudice that follows them through life from one country to the next. The forces that try but luckily fail to keep these women from their true calling and from freedom itself. This was one powerful novel and I also loved the other characters we meet along the way especially the Jazz musicians! I absolutely love jazz and play it myself so to be in a novel with these people was just an amazing experience and really cemented these girls stories for me. What a powerful novel on so many levels and a very clever one too. I got to know the Jazz scene in Montreal very well indeed when I lived there – I practically lived in these clubs so this was a huge huge treat for me to read. I found this book to be very interesting. Featuring two women who are trying to follow their passions and have to struggle with being different. I also enjoyed how both women were very different from each other yet had similar dreams and how their paths crossed to have their lives intertwined. First there is Katherine who was independent from an early age and started to pursue her dreams young. Then comes Mahsa who does not learn that pursuing her dream is an option until she moves to Montreal to get an education and sees the freedoms afforded to woman compared to her home country. I have to say that I preferred Mahsa's story simply because her circumstances infuriated me. As a female I find it difficult to fathom that every woman in the world does not have the same freedoms and choices that I do. I kept hoping she would find a way out of her situation and protect her children at the same time. A remarkably insightful novel crafted with care, weaving two stories into one. Under The Visible Life is the story of two women, who seem to come from two very different worlds. Mahsa, an Afghani-American Orphan who emigrates to Montreal as a young woman; and Katherine, the child of an absent Chinese Father and teenage Caucasian Mother growing up in Toronto adjacent Hamilton, Ontario. Both women have fascinating and forming childhoods, but are both drawn to Jazz Music and eventually find a true friendship and love, bonded by their shared love of music. Their lives seem to be so very different, even as adults, yet there are similar rhythms to their individual journeys, and deep chords that echo in both their lives. I found this novel to be both engrossing and enlightening, and was quickly pulled in to the twin stories of Mahsa and Katherine as they go through their lives with grace and truth. Under The Visible Life is a wonderful and worthwhile read. Reading my free copy of Under the Visible Life from Goodreads, I at first thought, not for me. Using words from a language I'm not familiar with, music I don't know anything worthwhile about made for a slow start. Mahsa and Katherine made me change my mind. They were brought together through their talent and love of Jazz. What for me was a minor interest except in the fact that it brought them together. Both from a background mixed parents and how that affected their lives. Mahsa's lost of her A Reading my free copy of Under the Visible Life from Goodreads, I at first thought, not for me. Using words from a language I'm not familiar with, music I don't know anything worthwhile about made for a slow start. Mahsa and Katherine made me change my mind. Both from a background mixed parents and how that affected their lives. Mahsa's lost of her America father and Afghanistan mother in a honour killing, growing up with relatives and after being sent to Canada for school, returns home and forced into marriage. Katherine had an America mother and Chinese father who wasn't around. She marries a fellow musician who is a man of colour. Although I found this book difficult to get into during the first part, the second part sucked me in and part three wouldn't let me go. It's a story of family, love, loss, betrayal, sacrifice. It's a story about chasing your dreams, finding your way, and remaining true to yourself. It's romantic, tragic, hopeful and resentful. Katherine and Mahsa come from very different backgrounds, but through friendship and their shared love of jazz music, they each discover a way to come to terms with their Although I found this book difficult to get into during the first part, the second part sucked me in and part three wouldn't let me go. Katherine and Mahsa come from very different backgrounds, but through friendship and their shared love of jazz music, they each discover a way to come to terms with their pasts and move forward. I found myself wanting to slap some sense into them early on in the story, feeling frustrated with the decisions they were each making. As I got to know them, however, I developed empathy for their situations and admiration for their tenacity and courage. I should note that I find the lack of quotations during dialogue irritating and confusing at times. Beautiful story, reminiscent of the Secret Daughter. Two women their lives, families and the shared love of jazz. Well written, sad to see it end. Kim Echlin was born in Burlington, Ontario. After completing a doctoral thesis on Ojibway story-telling, she travelled in search of stories through the Marshall Islands, China, France, and Zimbabwe. On her return to Canada she became an arts documentary producer with CBC's The Journal, and a writer for various publications. Her first novel, Elephant Winter, won the TORGI Talking Book of the Year A Kim Echlin was born in Burlington, Ontario. After completing a doctoral thesis on Ojibway story-telling, she travelled in search of stories through the Marshall Islands, China, France, and Zimbabwe. On her return to Canada she became an arts documentary producer with CBC's The Journal, and a writer for various publications. Her first novel, Elephant Winter, won the TORGI Talking Book of the Year Award and was shortlisted for the 1997 Chapters/Books in Canada First Novel Award. Her latest novel is The Disappeared. She currently lives in Toronto with her husband and children.